In this age of ubiquitous technology, it should be quick and easy to create a 30-second TV advertisement. 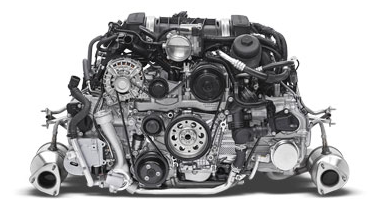 How complex can it be? The answer: shockingly hard if you do it right. To get TV advertising right requires a near impossible mix of science and creativity – disciplines that are in many ways diametrically opposed. It requires small teams that protect the purity of great ideas and big audiences that provide the feedback required to avoid mistakes. Great ads requires creative ideas that strike the most personal human chords with an appeal that spans cultures and continents. Among all of these contradictions, the core challenge of advertising is that you are delivering a message that nobody is looking to hear. When it comes to both TV and online video, the ads are the price of the programming and the competition is steep — in the U.S. the average person is exposed to more than 5,000 brands and ads every day. And many companies are organized to systematically dilute the power of great ideas. Creative advertising requires powerful ideas, emotion, and beautiful execution. Science requires the sort of measurement and optimization that slowly erodes the punch out of many creative endeavors. Keeping performance and creative impact in balance is difficult. Too many powerfully creative ideas are weakened by endless rounds of negotiation, revision, and compromise. Embracing these challenges, today our team at Indeed launched the first ad in our latest global TV campaign. The ad, titled “what / where” in reference to the highlighted Indeed search boxes that are featured throughout, will begin airing today in the United States. Additional versions will start to appear in 6 other countries over the next few weeks. This is my favorite Indeed ad yet — for me it strikes the right balance between emotion, inspiration, and performance. Like many strong ads, the final version is very similar to the first concept. We’ve worked hard to make sure that our tweaks didn’t erode the power of the creative idea. Performance: Indeed’s mission is to help people get jobs. After family and health, career may be the most important dimension in our lives. We know that if someone hasn’t heard of Indeed, we won’t be able to help them get a job. We advertise to drive awareness and carefully benchmark for each ad the cost per new person aware of Indeed in the labor force. Salience: We hope people will think about Indeed when they think about looking for a job. We want people to know that we’re the largest job site in the world, that we are a search engine for jobs (not a job board), and that an incredible # of new jobs are added to Indeed every day. We look for ads that build memory structures around these ideas. Global Relevance: We’re working hard to build Indeed into a global brand. To this end, we look for campaign ideas that get to the heart of human emotion, hopefully transcending culture and geographic boundaries. Practically speaking, we try to design TV ads that can be adapted to work in many markets around the world. Effective across multiple media channels: We talk about TV but we run adapted versions of our ads on youtube, full episode players like Hulu, other digital video networks, and social networks like facebook. This ad, in particular, was designed to work with or without sound. Protect the creative idea: By keeping our internal advertising teams small and by ensuring that we have minimal processes for internal review, we try to limit the number of people designing, reviewing, and refining an ad. Our goal is to keep the creative idea as intact as possible as we bring the ad from concept to launch. Transparent development: In a previous post, I wrote about the importance of transparency as a core marketing value. With this belief, we’ve made our entire advertising development process completely open and transparent within Indeed. Any of our 3,000+ employees can see all of the 500+ ad ideas we’re working at any time. We solicited company-wide feedback on the four most promising concepts prior to the final round of edits. The feedback was phenomenal — it helped is make the ads more relevant to more people around the world. Pre-launch testing & benchmarking based on emotion: Finally, when we have an ad that we think might meet all these requirements, we test and measure the emotional reactions to the ad in markets around the world. We then benchmark this measured emotional response against a database of ads to model likely performance. Only if it tests better than all of our previous ads will we put it into market. So that’s it — the difficult process of creating a good global TV ad. And even with all of that work and preparation, we won’t know how many people a new ad can help to find jobs until we release it at scale globally. If you want to build a great global brand, you’ll likely need to buy TV advertising. For most marketing organizations this means big budgets, a dependence on agencies, opaque pricing, and imprecise performance and ROI measurement. Even highly sophisticated marketing organizations struggle to get the most from their TV investments. The challenge with TV advertising is that it’s difficult (if not impossible) to identify people that saw your ad and to know whether the impression led to real-world action or behavior change. To measure and optimize the impact of TV ads, you need to do two things. The first is to measure the aggregate impact of TV advertising as a marketing channel. This can be done through very granular purchase analysis or surveys that measure brand awareness and preference changes modeled against media investments. If your marketing investments are at scale, you can typically measure the impact of different advertising channels (TV, social, online video, email, banner, and even out-of-home) on the results that matter to you. For most TV advertisers, however, this aggregate channel view is not enough: it’s essential to get closer to spot-level impact to get the most value for every invested dollar. While not all brands can do this, it’s typically possible if your TV advertising drives an immediate measurable action such as branded search for your company/product or visits to a digital site or application. If you can measure a digital outcome granularly, then it is possible to statistically model the cost per engagement for categories of TV spots such as particular shows or TV networks. The more ads you run during a show or network throughout the season, the more accurate this measurement might be. Doing this right requires the ability to look at your search and engagement data over time — ideally by second — attempting to pick-up the engagement bump attributable to a specific TV advertisement. These bumps are typically quick and recognizable. While they may only measure a portion of customer engagements (some happen much later), they provide a good statistical measure of performance. While they may not capture all of the benefit of advertising, it should help identify the relative performance of ads to help better optimize your TV spend. If you run very few ads, you will not have enough data for this type of analysis. When you finally see the details of show-by-show and network-by-network TV advertising performance while also measuring daypart and spot length, the results are surprising. In our own analysis, we looked at performance of our ads across more than two dozen networks and a hundred programs with significant numbers of ad impressions. The results were shocking. While we expected the impact-per-dollar-spent on a TV spot would vary by network, show, daypart, and program reach (high-reach programming is more expensive than low-reach programming), we were surprised by the broad distribution of results. In our analysis, we looked at the the cost to drive a web visitor with TV advertising. The range of real-world results was spectacular: On a network level (CBS, NBC, ABC, CNN, ESPN, etc), we found cost per engagement varied by more than a factor of 15. That’s right: the impact of 1$ spent on TV ads run on the highest performing network equaled the impact of more than $15 in advertising from the lowest performing network. In other words, a portfolio of ads run on the lowest performing network were less than 7% as effective as a similar portfolio of ads run on the best performing network. Not surprisingly, when you look at show-by-show performance you will find an even greater range of performance variation. Why do these differences exist? There are a few reasons. First, demographics vary by network and different audiences respond differently to any one company’s ads. Second, TV ad pricing is partly based on the reach of a show (high reach shows include valuable light-TV watchers) and the desirability of the program with advertisers. The wider the audience and the more popular the show with advertisers, the more expensive ads will be on a per-impression basis. In the highly-fragmented U.S. TV advertising market, there are many opportunities to lower costs by aggregating audiences. For marketers buying TV advertising, it’s nearly impossible to get great results without a clear picture of awareness gains or cost-per-engagement by network, show, spot length, day part, and ad version. By optimizing all of these factors — smart TV advertisers can improve TV advertising performance and ROI by 500% or more while still maintaining target market reach. For emerging businesses, it’s often difficult to know where to start with marketing. With finite resources, entrepreneurs need to focus on the things that will have the biggest impact at each stage of the business. Since marketing includes so many different types of tasks and activities — from researching customer needs to building demand — it can be challenging to find the right place to start. While every business is different, it is helpful to think about marketing as a series of distinct activities with a proper sequence. The first thing to think about — getting your product right — is the precursor to everything else you’ll do. The most aspirational stages such as building broad awareness and love for your brand require all the other parts of your business and business model to be working well. 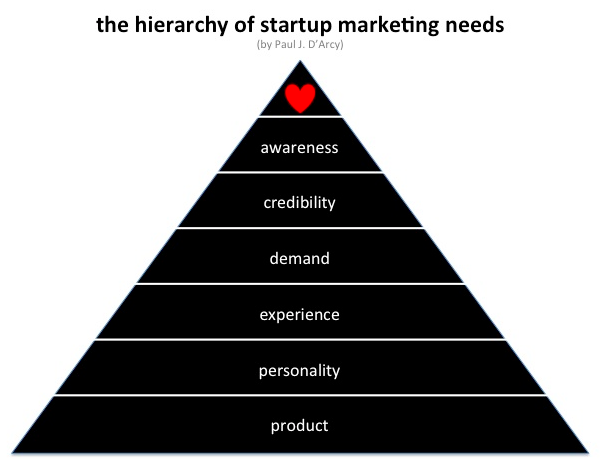 I think about the sequence or hierarchy of startup marketing needs as a simple pyramid with the essential marketing activities on the bottom and the aspirational activities on top. As entrepreneurs go up the pyramid, the marketing components become more expensive and more complex and return on investment becomes increasingly difficult to measure. Product — You can’t build a great brand with a mediocre product. Marketing requires making promises to potential users and customers. If the product doesn’t live up to expectations, nothing else matters. Get the product right first before even thinking about investing in other marketing activities. Read more here. Personality — The world is full of perfectly functional products that nobody cares about. The most successful products have personality: they are interesting, engaging, and likeable. They find their voice. They define what is special about the way they serve their customers and use their mission and values as a filter for product design and communication. They are willing to take a stand and fight for what matters to them and their customers. For more, read this classic blog post on Minimum Viable Personality. Experience — So you have a product and personality, it’s now time to take the next step and make sure that every interaction with customers is as good an experience as it can possibly be. Great customer experiences are carefully crafted and orchestrated and — increasingly — this is the job of the CMO. Experience is different for every company but almost always requires coordination across multiple people and disciplines. You may need to think through the purchase experience, the way you interact with customers, the experience of opening product packaging, the way that people reach you for questions, or how customers get help when something goes wrong. You’ll need to think about the way you communicate with customers, the way you thank customer for their business, the way that you train employees to create as consistent an experience as possible. It’s the visual identity that you use to make sure company or product and all of your communications recognizable. Demand — Demand drives sales which drives revenue and profits which are the lifeblood of any business. For this reason, too many entrepreneurs jump first into demand generation before thinking about product, personality, and experience. This is almost always mistake. For most businesses, the quality of the product, personality, and experience determine the economics of demand generation. If you product is differentiated, compelling, and enjoyable than your cost of acquisition will be lower. When you acquire a customer they will be more likely to refer their friends or colleagues. Good things will happen. While there are a near infinite number of methods to generate demand, management of demand generation really comes down to a few metrics and techniques. The starting point for demand generation is to set a targeted cost per acquired customer (or product sale) based on the financial model of the business. The next step is to test — to try as many methods and messages and designs and to measure the results. The best demand generation methods are scalable and able to deliver large numbers of acquired customers at the targeted price. Demand generation is where many companies begin to invest significant resources on marketing as part of their business model. The more revenue and profits marketing programs are able to drive, the more smart businesses are willing to spend. Credibility — For people to trust a new product, company, or approach, they need a reason to believe. It’s marketing’s job to help potential customers understand why their offering is better than other alternatives that a business or consumer might consider. In consumer categories, credibility may come from expert opinions, celebrity associations, exclusive distribution arrangements, or relationships with other businesses that people trust, among other options. In the seventies, for example, Trident’s claim that “four out of five dentists surveyed recommend sugarless gums for their patients who chew gum” provided credibility for their saccharine-sweetened gum. Sporting gear manufactures relationships with prominent athletes and teams provided similar credibility for their products. For many business-oriented and technical products, credibility often comes from commissioned research, surveys, white papers, awards, or benchmark reports that help people understand the value of the offering. Credibility comes next in the pyramid because it’s the first step towards broad awareness. To engage people who are less likely to be early adopters of your product or service, you’ll need to be able to demonstrate credibility. Awareness — For people to choose your product or service to solve a problem or meet a need, they need to know that your solution exists. The first step to building awareness is clearly defining the audience that you need to reach. The narrower the audience, the easier (and cheaper) it will be to grow awareness. For a useful pharmaceutical that requires a prescription, it should be easier to get thousands of doctors to prescribe the product than to get millions of patients to request prescriptions. If you are selling auto insurance, you probably only want to reach people who own or drive cars. Once you define your audience, there are many ways to build awareness. In the strongest businesses, awareness grows naturally and virally as your customers naturally interact with potential customers. Unfortunately, few businesses are lucky to have these dynamics. Other businesses need to invest to get their message out through advertising, public relations, social media or through the development of programs that encourage customers to recruit other customers. Unlike demand generation techniques which typically focus purely on return on investment, many types of awareness investments are more difficult (but not impossible) to measure. For consumer businesses, building broad awareness for a product requires strong execution on all of the levels of the hierarchy plus sustained investment in building awareness over time. In 2013, for example, 9 companies spent more than $2B each on U.S. advertising. Brand Love — This is where every business wants to be: to have their product or services broadly known and loved by the people they target. Typically, it takes perfect execution on all of the above marketing elements to achieve brand love. To get to brand love, you need to start my measuring every element of the customer experience. Using a tool like Net Promoter Score which looks at high likely a customer is to recommend your product or service. But measurement isn’t enough to be great. You’ll need to get it right at every level of the pyramid including a great product, personality, a memorable product experience, and broad awareness in the markets that you care about. I hope I’m not the first person to tell you that Tropicana orange juice would be flavorless without the help of a New Jersey perfume company. It probably all made sense 40 or 50 years ago when food and brands were manufactured in similar ways. But over the last 50 years, the core philosophy of corporate branding has shifted from “the story that you tell” to “the promise that you keep.” Tropicana never evolved. 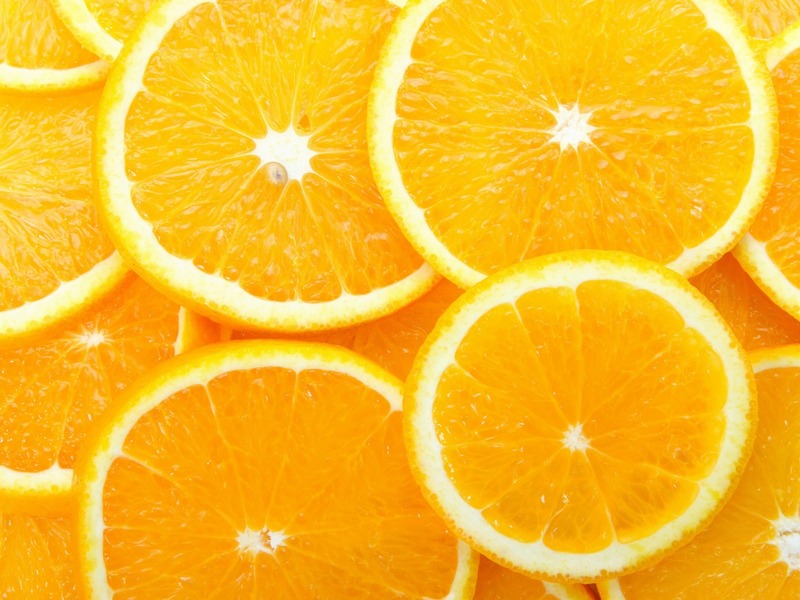 Tropicana Orange Juice: Fresh and Pure? Decades ago, big brands focused on manufacturing a brand image. Before the Internet and social media, brand building focused on telling a story about a product or service that made people want to experience it. Broadcast media was trusted by the public and Madison Avenue agencies were wizards at building brand stories that everyone believed. During this bygone era, truthfulness was a secondary consideration. Some of these brands are still alive and strong today. My favorite example is Tropicana. Many people my age have enjoyed Tropicana orange juice for years based on its unique taste and brand promise of premium orange juice “fresh from the grove.” Tropicana’s story was that the orange juice was fresh, never frozen, and never from concentrate. I judged the taste of other orange juice brands by the taste of Tropicana and wondered why other brands couldn’t match its fresh taste. Tropicana. Straight from the fruit. Orange juice direct from oranges, not from concentrate. If it tasted any fresher it would still be on the tree. Tropicana’s got the taste that shows on your face. Specially made for healthy bodies, healthy lives, healthy kids. In the food industry of the 1960s, 1970s, and 1980s, new production techniques made it possible to create highly-processed mass-produced food products that could be produced consistently, shipped globally, and sold everywhere. Tropicana created something new: a manufactured juice product whose premium price was driven by marketing and technology. Tropicana combined a strong brand with a unique taste and claims that were legally protected. For a generation of consumers, Tropicana was the benchmark for fresh. By today’s standards, however, Tropicana is a bad brand. Why? Because Tropicana broke its most core brand promise of a product described as fresh and pure. While Tropicana’s claims might be legally and technically true (the perfume flavor is made by isolating chemicals found in oranges and reassembling them into the flavor of Tropicana), the reality of the Tropicana manufacturing process leaves customers feeling betrayed. Once a loyal Tropicana customer learns the truth, the product never tastes the same. There is no good escape for brands built on false stories. Consumers take implicit brand promises seriously and are quick to shift brand loyalty when false or misleading claims are exposed. Good brands built on lies can become bad brands very fast. In the case of Tropicana, disappointed consumers have filed more than 20 lawsuits against the company. Today’s most successful brand builders make promises that they can keep. They highlight unique, authentic elements of their business that are meaningful to consumers. They make sure that product development delivers on the commitments they make. The best brands are built on trust. If your brand story is built on half-truths and misleading statements, it’s going to be a tough ride. The most interesting thing about Tesla — the niche luxury electric car maker — is the role of marketing in selling electric cars that cost $100,000 or more. Many people have tried to change the auto industry over the last 40 years and none have succeeded. The process of buying a car is essentially the same as it was a generation ago. And the process has remained unpopular for decades: the typical car dealer receives just 2 or 3 stars on Yelp. While Tesla is starting with expensive vehicles, they clearly have mainstream ambitions. They are investing to build a big car company. How hard is it to build and sell cars in the USA? Look at it this way: Tesla is the second oldest publicly traded auto company in the United States behind Ford. GM went bankrupt and went public four months after Tesla. Chrysler remains private following its own reorganization. While Tesla has a long way to go to be profitable, producing cars in volume, and moving towards the mainstream, their first home-built product — the Model S — is a success. They have 10,000 – 20,000 orders and have swept the auto industry awards, winning the most recent round of Motor Trend, Automobile, and Yahoo Autos awards for car of the year. Tesla is the first startup car company, and the Model S is the first electric car, to win these awards. So what can we learn from Tesla marketing? (1) Start with a great product – Tesla would be dead today if they didn’t build the best car available today. There are too many obstacles — range, lack of road trips, and buyer confusion to name a few. Tesla used electric technology to build a car that can’t be reproduced with a combustion engine. It’s as fast as a Porsche and gets the equivalent of 100 miles per gallon. It has very few moving parts. It is the most aerodynamic car made and has the most cargo space of any car in its class. It’s a sports car that seats seven. (2) Start high and work your way down — It’s a lot easier to build a lust-inducing $100,000 car than a cheaper model. 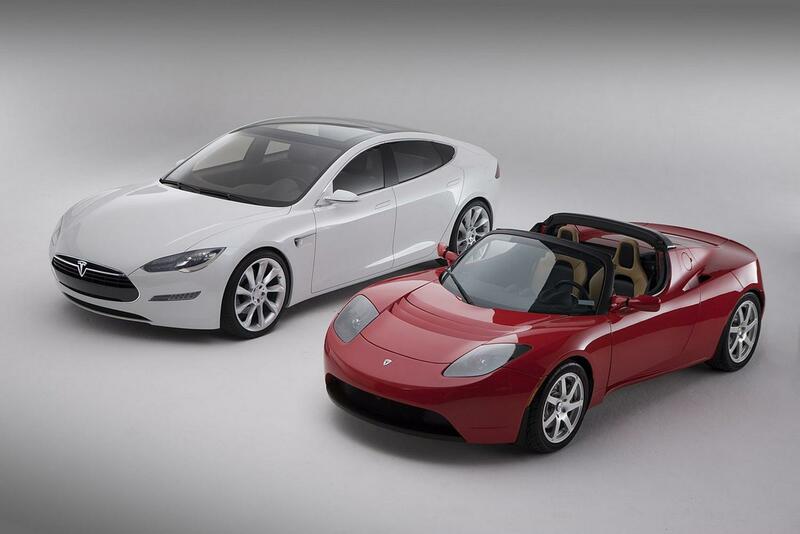 Tesla started with the $100K plus roadster built on a modified Lotus platform. With the Model S, they started with production of $100K vehicles and are working their way towards the $60K entry-luxury models. By starting high, Tesla is letting early adopters fund technology development. As volume increases, prices are coming down. The early super cars are media darlings endlessly discussed in waves of free Tesla publicity. (3) Turn auto industry strengths into weaknesses — Historically, luxury cars have been sold and justified based on the quality of their engineering. Most luxury automobile companies tout “performance through engineering” as the one thing that makes them special and desirable. Tesla marketing focuses on performance through technology while touting the simplicity of the platform. The Tesla Model S pitch reframes the auto industry strength as a weakness. Through the highly-effective Tesla marketing lens, traditional gas cars are dirty, complex, unreliable, and difficult to maintain. In a bold marketing move, Tesla service centers are designed with white floors to reinforce that electric cars don’t have oil and other dirty fluids that leak on the floor. (4) Create a new multi-channel model: Tesla decided not to build a traditional car dealer network. Nobody likes car dealers: even buying and servicing a high-end car like a Porsche is a dreadful experience. Tesla looked at the car buying process and optimized its sales model to fit the way people buy cars today. Since people start online, Tesla designed their process around online information, commerce, and community. Their site is unusually clear, clean, and effective. For people who want to see the car, they are building kiosk stores in malls with Tesla experts who can’t sell cars and who aren’t commissioned. When a buyer is ready, they place a refundable deposit online. If they want to drive a car, they can arrange a test drive after they’ve placed a deposit. Essentially, Tesla is selling cars the same way Apple sells the iPhone. (5) Build the community & focus on the experience: From the beginning, Tesla has made user forums and user community a key part of the online experience. 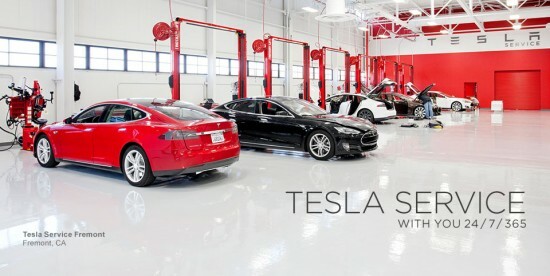 Tesla marketing highlights the unique Tesla buying and ownership experience and encourages owners to interact with the company and each other in full public view on the Tesla site. This provides a rich base of content — and owner passion — on view for prospective buyers. (6) Leverage the media and traditional press: While much is new about the Tesla Model S and the accompanying sales and marketing model, one thing is not: the dependence on traditional media. Tesla has been a master at driving press coverage, reviews, and awards for its cars. It’s clear that the company has worked hard to position the brand with the media and to make sure the right messages come through. The company’s #1 message is that they are trying to build the best car ever made and not just the best electric car. This message is frequently repeated by the press. While it’s early and many many risks remain, Tesla is the first company to have the potential to become the Apple computer of the car industry. Like Apple, they are selling a product that is very different than what has come before. Both companies focus on great products and innovation. They are both building their own ecosystem (Tesla’s super charger network is akin to Apple’s build-out of iTunes and the Apple Store) and both are challenging traditional sales models with their own direct distribution system. In fact, Tesla hired Apple’s previous retail chief to build out the new distribution model. Whatever does happen with Tesla, the marketing lessons to come are certain to fascinate. Email marketing is a delicate art. In today’s world, fewer than 1/5 of recipients will open a commercial email message. For every 10 people who click on an email link, one person permanently opts out. While new subscribers are likely to open and click, results fall-off by 65% or more within just 4 months of email list subscription. For most marketing organizations, email lists are full of high-potential contacts who no longer wish to receive email. In B2B, this is particularly an issue in businesses with long sales cycles and high levels of lifetime customer value. While a prospect may be interested in a product or solution, they may not want to receive any commercial email. A few weeks ago, Facebook rolled out a new advertising feature that allows marketers to display ads to targeted recipients selected via email address, phone number, or Facebook user ID. The new feature allows a self-service advertiser to upload an encrypted list of 20 or more contacts with the ad they want to show. Facebook will automatically target the supplied ad to the specified contacts. This type of marketing, often referred to as CRM retargeting, allows advertisers to invest in building awareness or driving conversion within a known group of contacts. A large IT provider, for example, could drive an online campaign targeting known CIO’s who arbitrate buying decisions for their firms. A telecom company could market new devices to customers on expired contracts. Concert promoters can promote shows to people who have purchased tickets in the past. And all of this can be done using a prospect’s email address or phone number but without sending an email. For B2B marketers focused on nurture marketing or content marketing, CRM retargeting enables marketers to reach prospects with relevant messages and content through an additional channel. It makes is possible to invest in advertising specifically targeting people who would prefer to not receive email. For companies with very large accounts, it would be possible to build account-targeted campaigns that deliver a unique message to representatives of a specific company. For companies looking to build a Facebook follower base, the new model allows them to promote their brands directly to a list of customers or fans who are most likely to engage online. While others have attempted to use email as a filtering method for display advertising, two things makes Facebook’s new service unique: a billion member reach and a collection of multiple address for many of their members. For people with multiple addresses — work, home, school — Facebook is likely to have a match for whatever address might be in your CRM system. It seems that the fate of the major advertising-driven consumer Internet companies will be determined by the success of mobile advertising. As people spend more time on smartphones and less time on PC’s, a healthy mobile advertising market is needed to monetize the great free applications and Internet services that we all enjoy. For FaceBook, in particular, mobile advertising metrics seem to be closely linked to enterprise valuation. But here is the big problem: mobile display advertising doesn’t work. This is why mobile ads sell for as little as 20% of their web display peers and at a small fraction of the per-impression cost of more traditional media. Lack of Cookie Support = Minimal Targeting: In the online display world, browser-based cookies enable powerful tools for segmenting users based on interests or previous interactions. For example, when you abandon an online shopping cart, advertiser’s can track you with ads designed to lure you back into their online store. These cookie-based behavioral and contextual capabilities don’t exist today on mobile platforms. In fact, if your user is on an iphone, they are probably using Safari which turns off cookies by default. This means that ad targeting is incredibly difficult and only marginally relevant. Ad Click = User Experience Disruption: Clicking on an application or browser-based mobile advertisement is an unpredictable experience. It’s not clear where the ad will take you or how a user will return to where they want to be. The only thing that is predictable is that an ad click will disrupt whatever task the user was previously trying to accomplish. This is particularly important because mobile device usage tends to be highly task oriented: users typically engage with a browser or application with an end in mind. 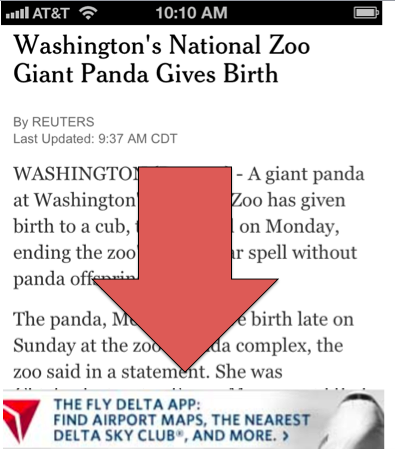 Tiny Ads = Useless Brand Experience: Tiny standard 1/3 inch by 2 inch mobile ads are too small to engage prospects with a compelling message. As Gilad De Vries wrote in Forbes (describing online display), “you can add all the bells and whistles you want to banner ads, but they’ll never truly create the kind of emotional experience that gets consumers excited about your brand.” This is infinitely more true for mobile display ads. Bad Measurement = Underperformance: If you’ve ever tried to navigate around a 1/3 inch ad on a touch display, it’s very easy to accidentally click. In fact, research has shown that 40% of online clicks are either accidental or fraud. In a domain where advertisers relentlessly measure performance and return-on-investment, the math of mobile display doesn’t work. Application Fragmentation = Limited Ad Interaction: As a marketer, my hope is that an ad click will result in a rewarding experience or a useful transaction. In a mobile world of purpose-built applications, it’s very difficult to deliver ads in context that drives any sort of meaningful interaction. When a user does interact, the many mobile platform, application, and screen limitations make it very difficult to create a positive experience for a mobile prospect. So where do we go from here? Some big vendors will figure out new ways to monetize mobile that don’t rely on display. A great example of this is promoted tweets that appear on mobile Twitter clients. But for the ecosystem to thrive, there needs to be industry-standard advertising mechanisms that deliver real results. Otherwise, there will be many fewer ad-supported free products and services for users to choose from. Consumer marketers have become adept at driving revenue based on predictive analytics. Potential customers are routinely scored on a wide variety of attributes from lifestyle to promotion receptiveness. These scores allow consumers to be segmented into groups based on shared interests, purchase likelihood, and total buying power. By starting with highly differentiated segments, marketers can design programs that are highly relevant and effective. This is not the way that B2B sales and marketing works in most organizations today. Yet, B2B is a ripe environment for predictive analytics: selling costs are high, sales probability is low, and resources are very expensive. While the language of B2B marketing and sales is full of references to probability — customer funnels, response rates, conversion rates, close rates, call-to-close ratios — it’s rare to see B2B organizations leverage prospect and customer data to score customer attributes, build discrete segments, and allocate resources to maximize the conversion and revenue. But all of this is about to change. Over the next five years, common consumer marketing techniques will find a happy home in many B2B marketing and sales organizations. Electronic sales processes are creating massive amounts of useful data: Today, B2B buyers spend more time interacting with companies online than they do with sales people in person or over the phone. For every successful sales call they attend, a typical prospect may spend hours interacting with content, reading forums and blogs, and testing sample products. In today’s world, every buyer action leaves a trail of digital clues that signal their context, needs, purpose, and intent. Prospect attributes can be easily deduced from observable data: Most B2B organizations with CRM and content marketing capabilities have enough data to score prospects on purchase probability, likely problems or interests, and potential solution needs. Relevancy matters: Even as the typical portfolio of products and solutions becomes more varied and complex, B2B sales and marketing messages tend to be narrow and simplistic. The patterns that work most consistently are destined to be forever repeated. For prospects, this means that they are often hit with messages and a pitch that ignore the nuance of their particular needs and segmentation. For many prospects, this is a turn-off that is difficult to reverse. If you are planning to go out tonight to play billiards at a bar in Montreal called Sharx, you might want to pay with cash. Predictive analytics from Canadian Tire demonstrated that Sharx customers are the more likely to default on credit than patrons of any other drinking establishment in Canada. The analysis by Canadian Tire, now a decade old, marked the beginning of a wave of predictive analytics that now has companies trying to guess your next move — no matter how private it may be. Are you going to get married? Are you having a baby? Are you likely to get a divorce? Might you run into financial problems? Are you changing jobs or moving cities? Who are you going to vote for? Who are you likely to buy something from? What big purchase are you likely to make next? When will you get sick? How soon might you die? 2. Predicting Divorce (Credit Card Companies): In the book Super Crunchers, a Yale professor describes how a major credit card provider uses purchase data to predict divorce, which in turn, helps the company predict potential future credit problems. 5. Predicting When You Will Switch to Fedex (UPS): UPS uses data analytics to predict when customers are at risk of abandoning the company and switching to one of its competitors. Whenever a potential switcher is identified, the company tries to prevent the loss with a phone call from a salesperson. When it comes to advertising, personal data can be incredibly valuable. And when it comes to personal data, few organizations know more about you than Google. As you browse the web, Google tracks the sites in its sprawling ad network that you visit. As Google tracks your browsing patterns, it builds a profile of your inferred interests and demographic categories which are then stored in your Google cookie. My cookie was quite accurate: it included valid generic categories such as music, business news, consumer electronics, enterprise technology, CRM, Air Travel, andMobile / Wireless. It also knew my gender and age band. If you want to see what Google knows about you, you can view the contents of your cookie here.